When choosing an online platform for real-money roulette, punters should pick a casino and a banking method that are the most suitable for them. One of the fastest, most convenient and secure ways to deposit funds into your gaming account right now is iDebit. Roulette players who want to enjoy their favourite game on the Internet should pay extra attention to the payment methods they can use at each web-based casino. Available to customers from Europe, Australia, Canada and the UK, iDebit is a relatively new system for online payments. It is owned by Instadebit International Solutions Ltd., the company behind another quite popular payment method, Instadebit. Both services utilise the customer’s online banking account to make instant transactions to online merchants without using a credit card. While the two brands sound quite identical in terms of the service they provide and even their names, they differ from each other significantly in several aspects. But let us first focus on iDebit and then, compare it with its sister company, Instadebit. This is a provider of third-party online payment processing services which uses the customer’s account in a certain financial institution. In other words, iDebit acts as an intermediary between your bank and online merchants in transferring funds from your checking or savings account to the merchant or online casino in this case. It facilitates payments the other way round, as well, but in a slightly different manner. One of the best things about using iDebit to make deposits into casino websites is that you do not need to register an account with the service. You just need an active online banking account at one of the associated financial institutions. In comparison, Instadebit also transfers funds from your bank account to online merchants, but it does require you to sign up and create a separate account. With its main product, it gives you access to a separate balance that is funded via your bank account. In its essence, Instadebit is a digital wallet, despite being a little different from popular e-wallets such as Skrill or Neteller. Looking back at iDebit, we can easily see it is much simpler and easier to use than any e-wallet on the market. It is extremely secure, reliable and efficient in moving funds from your bank account to your gambling balance. But is it the ideal solution for you? You can find out by reading the full review of iDebit as an online casino banking method. As explained above, iDebit works by linking your bank account and the merchant without sharing any banking or credit card information with the online retailer or the casino. It is in partnership with various banking institutions in multiple countries which allows it to provide online banking services even when such services are not supported. While the idea may sound a bit vague, here is a simple example – you wish to make a deposit into an online casino, but the gambling operator does not process deposits from the particular bank where you have a savings account. In addition, your bank has a strong policy against accepting or transferring gambling and betting-related payments, so it does not allow deposits and withdrawals from this casino. This is where instant online banking services such as iDebit step in. It facilitates transactions between banks and online casinos (or any other merchants on the web) by partnering up with both sides. Interestingly, customers do not need to register an account with iDebit, as it directly connects them with the online banking interface of the particular financial institution. Thus, casino players are able to use their online banking to play roulette for real money while at the same time, they do not share any credit card or banking information with the casino, with iDebit, or with anyone else. No sensitive data is disclosed on the web and the only financial information the gambling operator has about you is that you use iDebit. There are several other things players need to know about this payment method before they start using it at online casinos. Although it is being marketed as a Canadian-only payment service, it is actually available in a variety of countries, which currently include Australia, Austria, Belgium, Canada, Estonia, Finland, France, Germany, Great Britain, Hong Kong, Hungary, Italy, Japan, Latvia, Lithuania, the Netherlands, New Zealand, Poland, Portugal, Slovakia, South Africa, Spain, and Sweden. The list of supported banks is also diverse – in the UK, for instance, iDebit can be used by all customers of HSBC and Barclays who have activated the online banking services. In addition, customers can choose from several currencies, including GBP, EUR, USD, CAD, and AUD. Another thing to take into consideration is that iDebit offers customers two options – they can either register an account at the website of the payment method or use it as a guest when making a deposit. While no sign-up is required when topping up your casino balance through iDebit, registration will be necessary if you wish to withdraw your winnings from the casino using the same method. The process is explained in more detail in the following sections. Funding your casino balance via iDebit is extremely easy and takes only a few minutes. First, you need to make sure you have an active account with one of the associated banks and check whether the casino you are playing at offers iDebit. To top up your account, you should open the Banking or Cashier page of the casino website and choose iDebit from the list of available deposit options. A new window will open and you will need to pick the country where you reside in, as well as the bank you have an account with. Then, you will see the familiar interface of the online banking system you normally use. Then, you simply need to log in using the credentials provided by your bank – user ID, password, number of bank account, security token, etc. 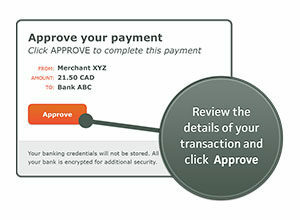 After you enter the amount you wish to deposit, you need to authorize the transaction and log out. The funds are transferred instantly in real time, so they will be displayed in your casino account immediately. Alternatively, you can sign up for an iDebit account and use it to make a deposit. This time you will not need to sign into your online banking account, but instead, log into iDebit. After you enter the preferred amount of money and confirm the transaction, the service will automatically transfer the funds from your bank account to your gaming balance. Along with being a secure and flexible deposit method, iDebit is also a great option for withdrawing your winnings from casino sites. As we already mentioned, you will be required to register a separate account in order to cash out using this service. Signing up is free of charge and really simple – you need to provide your full name, date of birth, email address, postal code and country of residence. Once the registration process is complete, you can proceed by linking your bank account with your iDebit wallet – you just need to select Register Bank Account and enter the details found on your personal cheque (or the details, provided by your bank). You can add as many bank accounts as you wish and choose the one you want to take funds from each time you make a payment. When you already have an iDebit account, it is extremely easy to withdraw and move funds to it. Just open the Cashier section of the casino site and pick iDebit from the list of withdrawal options. Note that not many online casinos would process payouts to this digital wallet. Unlike deposits, withdrawals take longer to complete. The casino first needs to approve the transfer, which may take anything from a few minutes to 24 hours (in some cases, this period is even longer). When the transaction is cleared the next day, the winnings from the casino will be in your iDebit wallet. From there, you can spend the funds wherever iDebit is accepted or simply withdraw them back to your bank account whenever you want to. If you choose to retrieve funds from your iDebit account to your bank account, this will be completed within 5 business days, but you can also opt for getting paid by a cheque or a money order. In this case, the funds will reach you within 1 or 2 business days. There are certain fees casino players should take into consideration when using iDebit for gambling on the Internet. The service does not charge you for depositing into your gaming balance and for withdrawing winnings from it, provided you move the funds from your iDebit account. If you make a transfer directly from your online banking to the casino using this method, i.e. without registration, you will need to pay a flat fee of £/€/AU$1 ($/CA$1.50). Note that your bank and the casino may impose some processing fees, as well. While transferring funds from the casino to your iDebit balance is free of charge, withdrawing from iDebit to your bank account is charged £2 per transaction. The fee remains the same in the other supported currencies. In case of a currency conversion, iDebit will use exchange rates for the particular day. A small premium is charged additionally. When it comes to limits, they will depend mostly on the bank you have an account with. Along with the daily limits and the limits per transaction imposed by the bank, you will also need to comply with the limits set by casinos. Another thing to remember when using iDebit and similar payment methods is that you cannot split payments between two or more bank accounts – if you do not have enough funds in the bank account you have chosen, the transaction is cancelled. For most punters, one of the biggest concerns of playing roulette and other casino games online is security. Issues like hacked accounts and stolen credit card data are now more threatening than ever and this is exactly what iDebit was designed to protect players from. On its website, the company identifies security as its top priority and lists all the measures it has taken in order to guarantee a safe and pleasant online experience for its customers. When using iDebit, players can be certain the payments are processed via their trusted online banking environment where banks employ strict security protocols. Your identity is verified through various documents while bank authentication guarantees that it is indeed you who logs into your user account. You will be given various credentials such as passwords, security codes, PIN codes, security tokens, and as a step to further improve security, you may be required to set up a security question. Of course, all financial transactions are monitored and verified, while any personal information is transmitted in a secure manner with the help of 128-bit encryption technology. With so many diverse banking options casino players have at their disposal today, it may be hard to choose the best deposit and withdrawal method for themselves. However, iDebit is one of the very few services that manage to successfully combine convenience, safety and flexibility, while remaining fully functional and keeping additional fees extremely low compared to traditional credit cards or wire transfers. Of course, the privacy this method offers is very important to many punters who prefer not to openly share their banking details with all kinds of merchants on the Internet. It is also great for those who do not wish their passion for casino games to be listed in their bank statements. The only minor disadvantage of using iDebit for casino deposits and withdrawals is probably the fact that it is still not widely accepted as are, for instance, some credit cards and e-wallets. The service is constantly expanding to new markets and partnering up with new banks in more and more countries. Currently, it is best tailored to Canadian residents as it is supported by all major banking institutions in the country, including the National Bank, Royal Bank of Canada, Scotiabank, and more. However, it is still unavailable to a lot of online casino players in parts of Europe, Asia and the Americas.